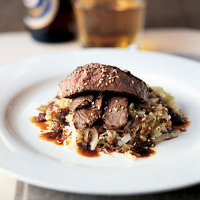 This delicious beef dish is ready in no time. Cook the rice according to pack instructions. Quarter the cabbage, remove the core and shred finely. Pat the meat dry and trim off any fat. Mix 1 teaspoon of the sugar with the thyme and rub into the meat. Lightly toast the sesame seeds in a frying pan. Remove from the pan. Heat 1 tablespoon of the oil in the pan and fry the shallots for 1 minute until softened. Add the cabbage and stir-fry for 3-4 minutes until golden. Drain the rice and stir into the cabbage with the sesame seeds. Transfer to serving plates and keep warm. Rinse out the pan and heat the remaining oil. Fry the beef for 1 minute on each side for rare, or an extra 2-3 minutes on each side for medium to well-done. Transfer to a board and cut into thin slices. Pile on top of the cabbage and rice. Put the remaining sugar in the pan with the soy sauce, ginger and 5 tablespoons cold water. Heat until bubbling then pour over the beef and serve.